The new Kindle 4 come with an incredible $79 price tag. Many new Kindle 3 owners start to think to return the Kindle 3, buy Kindle 4 and save some money for others accessories like cases … But is this a good decision? Is the new Kindle 4 better than Kindle 3 or at least the same but at a better price? Let’s run our usual eight round comparison review: old Kindle 3 Versus Kindle 4. 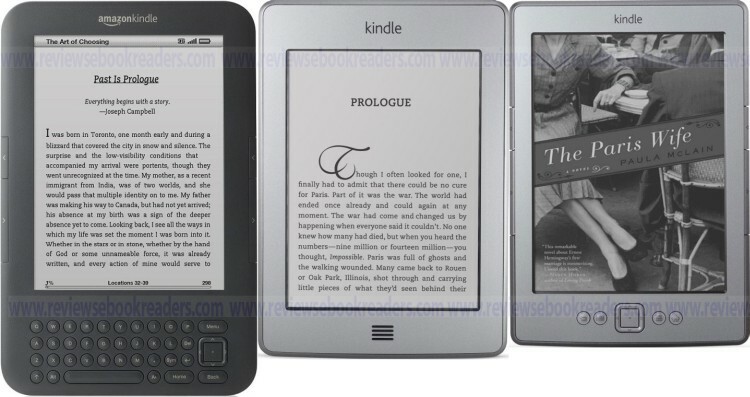 Note: I talk here about Kindle 4 no touch, for Kindle 4 Touch please read Kindle Touch Versus Kindle 3 review. kKindle 4 has no keyboard as Kindle 3 but Kindle 4 is lighter than Kindle 3. You should decide what it is more important to you: keyboard or portability? No points in this round because the display is the same for Kindle 4 and Kindle 3: 6 inch, E Ink display, 600×800 pixel resolution. As the flash storage price goes down, the Amazon cut the storage size in Kindle 4… So, Kindle 4 come with 2GB but only 1.25GB available for ebooks. As no card reader available in Kindle 4 there are no way to expand your Kindle 4 storage. Kindle 4 – Kindle 3: 0-1. Kindle 4 is lighter and smaller: 30% lighter, less than 6 ounces and 18% smaller body. Complete data in the table. I add the Nook and Kindle Touch in table to have a better comparison. Kindle 4 – Kindle 3: 1-1. Battery life is a very important feature for an ebook reader portable device. So, Amazon cut the Kindle 4 autonomy at half than Kindle 3. So, battery life is 2-4 weeks for Kindle 4 vs 1-2 months for old Kindle 3. Kindle 4 feature only WiFi and there are no option for 3G. For Kindle 3 we can choose WiFi or WiFi + 3G. Again Kindle 3 collect one point. Kindle 4 – Kindle 3: 1-5. Kindle 4 feature the experimental browser but you can imagine your self try to use 5-way controller to type URLs? No way! You like audio books? Forget about audio books if you plan to buy Kindle 4 as it has no speakers or audio jack. My final score: Kindle 4 – Kindle 3: 1-6. I think Amazon set a price point for Kindle 4 and cut a lot of feature from it. 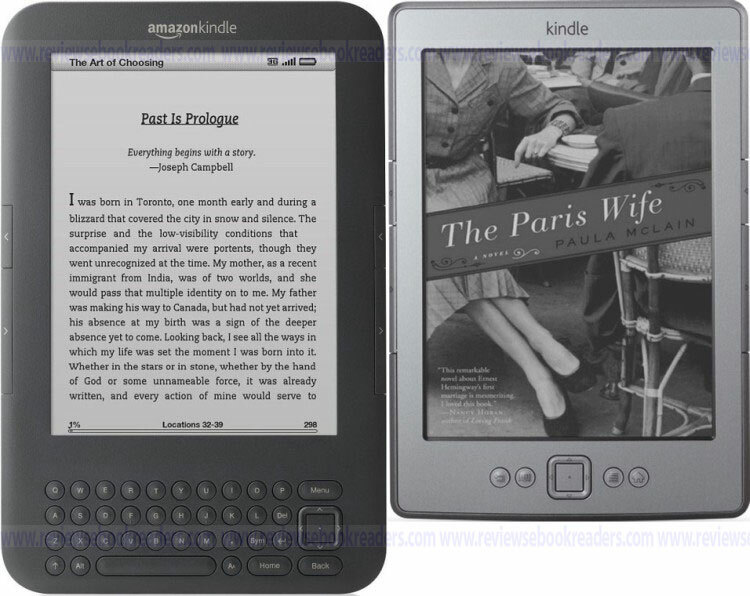 So, if you are looking for a simple ebook reader with a very good price tag Kindle 4 is your best choice. If you are demanding for an ebook reader full of great future you should consider Kindle Touch or Nook. Buy Kindle 4 at Amazon UK. You took the comparison chart that can be found on the amazon page for the kindle and added words around it to make it harder to compare. This is an excellent comparison between the models. I have just the kindle 4 (no touch). I find it ultra portable and it fits in my back pocket nicely. I got the one with special ads. The ads don’t bother me one bit! Thanks for this review. Now I will sleep better at night not worrying if I’m missing out on the new Kindle. What will make me buy a new one is when they invent the E ink in color, so I can read comics and see photographs from books without the backlight. Currently images are the weakest part of any Kindle. The new Kindle Fire didn’t get around that issue because it uses backlight. Thanks for the easy to read comparison! I own the Kindle 3 and was considering a new 4 for my daughter, but now I think I will stick with the 3 for practicality, ease of user interface, and battery life/storage capability. What about page turning speed? How does the Kindle 4 compare with the Kindle keyboard? Page turning is better on Kindle 4 but unless you are reading 28 point text and turning every other moment, it hardly matters. Compared to turning the pages of a book, any electronic turning is superior. I have a Kindle 3, my wife a Kindle 4 which has impressed me, smaller size and absence of a keyboard you hardly use (browsing on a Kindle is unbearably painful. I’ve done it when there was no alternative but more than once gave up in despair). I was about to order a Kindle 4 for my son and decided I’d look at the specs. The more I looked the more attractive the old Kindle 3 became, particularly now that prices on it have dropped. I’ll end up getting a 3 for my son. Are you sure about the chart? It’s said that kindle 3 is the lightest of them all, even compared to kindle 4.